With her heavy-handed contour and wild makeup, few RuPaul's Drag Race alumni are as instantly recognizable as Trixie Mattel. The reality competition's Season 7 favorite admits her look hasn't always been so unique though. "I used to do drag like a normal person, and look like a normal drag queen, but then I wasn't enjoying it any more," Mattel shared on a recent episode of Party Foul Radio with Pollo & Pearl. "I was on the verge of quitting." As her passion for performing waned, Mattel says she had an epiphany. In the world of drag -- built on fantasy -- her stage persona could be anyone (or anything) she wanted. That started an evolution for the Chicago-based performer's character. "I was reading this book from the '60s about how they used to paint these little orange heads to make them look three-dimensional, like a little doll," she shared. "So I started painting myself not as a woman or a man, but as a plaything." Soon Mattel's drag took on elements of toys she wanted to play with as a child, but couldn't. Her outrageous eyes became those of My Little Pony. Her shape was based on Polly Pocket. "I didn't do comedy either. I just did normal lip-syncing and dancing," Mattel stated. "I knew I was funny, but I never thought of making Trixie funny -- and I never thought about making her funny looking." As her appearance changed, Mattel told Podomatic's No. 1 LGBT podcast Party Foul Radio her performance style evolved as well. Now she is known for her campy looks and comedic performances. This will be showcased when Mattel joins the Drag Queens of Comedy Sat., May 28 at San Francisco's Castro Theatre. Produced by Sasha Soprano, Drag Queens of Comedy combines comedic legends such as Lady Bunny and Peaches Christ as well as favorites from Drag Race including Mattel, Season 5 favorite Alyssa Edwards and Season 8 winner Bob the Drag Queen. The show is hosted by Bianca Del Rio, a performer Mattel knows well. When her photos first popped up as a Season 7 contestant, Mattel says many compared her outrageous look to the winner of Season 6. "When I got on, [fans] thought, 'Oh, she's trying to be Bianca.' They see white eyeliner and think drag started seven years ago," she joked, "They think Drag Race started drag...I think for audiences of Drag Race, their library of references is very small." This narrow band of references, of course, led many to draw parallels between Mattel and Season 8 finalist Kim Chi. While some distinguishing characteristics between the best friends seem undeniable, Mattel says the two have never seen similarities in their drag. Mattel says any likeness comes from sitting side-by-side almost daily, doing their makeup before they were Drag Race stars. Secondly, she says coming from Chicago influenced both. "We come from a market where we wear a lot of makeup," Trixie shared. "We're from a world of drag where people wear a lot of makeup: big hair, big fantasy, lots of jewelry." That's where the similarities end, though, she says. Mattel's admitted goal is to "look the same every day, like Trixie just walked out of her Barbie Mansion." On the other hand, she admits she'd "never be close" to Chi's skills as a makeup artist. "She's one of the best I have ever seen. She can turn her face into anything," Mattel raved. "She's a chameleon. She's an ever-changing piece of origami...She's such a good makeup artist, it's stupid!" 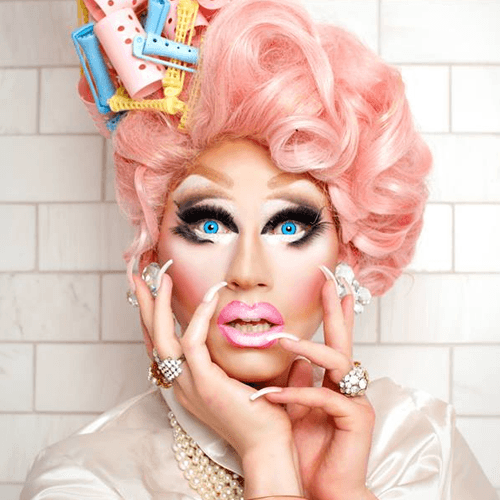 Trixie Mattel, Lady Bunny, Peaches Christ, Alyssa Edwards, Bob the Drag Queen, Bianca Del Rio & More Appear at Sasha Soprano's 'Drag Queens of Comedy' at San Francisco's Castro Theatre, Sat., May 28.